The Remington Core-Lokt ammunition brand is a heavy hitter in the hunting world. The Core-Lokt line up is known for having rounds available in a variety of calibers, designs made for a multitude of game animals, and they are available in a massive plethora of configurations. The defining features of Core-Lokt ammunition are the high-quality brass primed with the dependable Remington primers, the most reliable controlled expansion bullet on the market, and Remington’s famous smokeless powder types. 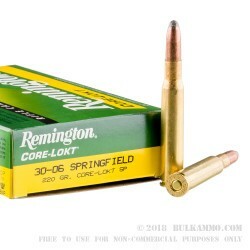 This Remington Core-Lokt 30-06 ammo is loaded with a heavy weight 220 grain, Soft Point or SP lead core bullet with a heavy duty thick copper jacket that covers every part of the bullet except the tip. The soft pointed lead tip and core are mechanically locked to the jacket. These features provide the shooter with a consistent projectile that expands each and every time it's used on the hunt. When it expands, it is well-known for retaining almost all of the heft of the jacket and bullet. 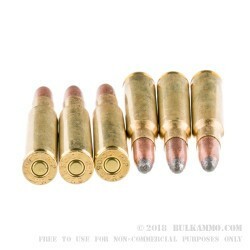 Each of these Core-Lokt Bullets are set into a thick wall, heavy duty, new, reloadable, Boxer primed, non-corrosive, polished brass case. 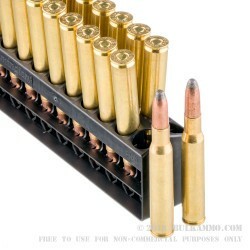 These cartridges are reported to have a muzzle energy that strikes a heavy hitting 2837-foot pounds, and its muzzle velocity is just as impressive as the energy with its reported 2,410-feet per second. Whenever a round has a muzzle energy that exceeds its muzzle velocity, you know that cartridge was designed to do its job and then some. You can be sure when you hit the wild and you’re out on the hunt, these loads will not fail you. These .30.06's are ready to go whenever and where ever you are. 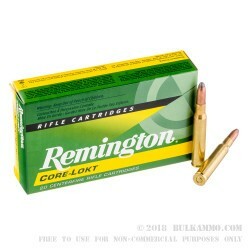 You will instantly recognize them in their famous Remington 20 round yellow-green boxes. They are lightweight and easy to take with you for plinking fun with the family, on any of your hunting trips, or testing the limits of a newly built rifle platform. Grab multiple boxes and get out hunting today!